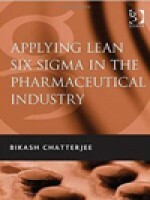 Bikash Chatterjee's guide to lean manufacturing, six sigma and operational excellence in the pharmaceutical and biotech industries explores how these techniques can be applied across every aspect of the business; from the earliest processes of project selection through the clinical trial process, manufacturing and supply chain. Challenging conventional wisdom, Applying Lean Six Sigma in the Pharmaceutical Industry offers a quality perspective on lean manufacturing and provides the very latest thinking on Process Analytical Technology and the opportunities of designing for quality.Each chapter includes discussion around the values to consider for the application of lean, six sigma principles and tools and culminates in a case study for that application. The book is organized to reflect the major work centers involved in the drug development lifecycle. Each chapter is stand-alone but together drive home the necessary synergy between lean, six sigma and compliance sensibilities required to be successful in the pharmaceutical industry.These design, manufacturing and management techniques are not without their challenges -how do you balance a lean philosophy with the dramatic growth and change in the market for drugs in the developing economies? Bikash Chatterjee's book offers direction to an industry that is struggling to reinvent many of its processes.